Cristiano Ronaldo: "This is the moment to win or lose everything"
16.04.2011 » Cristiano Ronaldo: "This is the moment to win or lose everything"
Cristiano Ronaldo is aware of the importance of the next weeks for the outcome of the season. CR7 is confident that Real Madrid has what it takes to beat Barcelona and trusts on José Mourinho and his teammates to finally win a trophy this season. Cristiano Ronaldo granted an exclusive interview to the Portuguese newspaper "Record", which got released the day before the first of four Clasicos to be played, between Real Madrid and Barcelona. CR7 approached several topics and talked about his team mates, rivals, training routines and some of his childhood memories. Cristiano Ronaldo started by admitting that Marcelo and Ozil are the players who have been impressing him the most: "Marcelo has been fantastic this season and Mesut Ozil is doing a tremendous job, specially if we have in account that this is his first season in Real Madrid and the first time he plays in the Spanish League. I'm also very happy with Pepe and Ricardo Carvalho performances." It was then asked if there's anyone from other teams who Cristiano Ronaldo is impressed with and the Portuguese star, quickly fired back: "Honestly, I haven't thought about them, but I admit there were some who impressed me. I must confess I'm very happy to play in a league that has so many talents." The four "Clasicos" coming up between Real Madrid and Barcelona don't leave anyone indifferent. Cristiano Ronaldo reckonized how crucial this moment is to define who will take the trophies at the end of the season. CR7: "I'm not nervous, but I'm definately excited. This is the moment where we can win everything or nothing." The journalist also asked CR7 if he changes the way he plays, depending on who his opponent is. Cristiano Ronaldo: "No. I try to always play my game. I don't care about who we'll play against or how they play, I always do my thing. One thing is the theoretical game and another is the real game. It's completly different and that's why we can't change some things. I only try to do my best to help the team." Regarding the training methods, Cristiano Ronaldo said that some of his training exercises and routines are still the same as the ones he had by the age of 17 or 18. "Those exercises that I know I do well, I keep. I did some exercises with 17 or 18 years old, that I still practise these days being 26 years old. If things are going fine, I keep doing the same." An interesting question came when Cristiano Ronaldo was asked if there was a game that he has watched in the past, that somehow might have inspired him, while still being a youngster. CR7: "In the 1994 World Cup, that took place in the United States, I remember watching Brazil winning the tournament. I followed it in Madeira with my family and we were all cheering for Brazil. Those are good memories. That made me feel motivated for my future, because we always tend to look after the best players and teams to inspire ourselves. That was very good for me". To end the interview Cristiano Ronaldo left an important note about football and life in general, when asked to comment about the exhaustion some players show at the end of the season. CR7: "Every player is different. If we run 200 meters, we'll feel more tired in the last 20 or 40 when compared with the beggining. That's normal. In the end of a season, players just feel more tired. That's football... well, that's life. 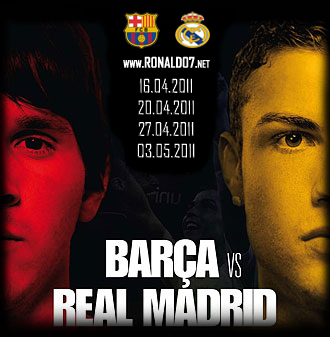 Remember that you can watch Real Madrid vs Barcelona livestreams, online here on ronaldo7.net, tomorrow. Cristiano Ronaldo is expected to play from the start.